BAR HARBOR, Maine —September 28, 2017 — The Wild Blueberry Association of North America (WBANA) announced today that it will celebrate 20 years of collaboration and study of the health benefits of Wild Blueberries at its annual Wild Blueberry Health Research Summit in Bar Harbor. Each year up to 30 elite scientific researchers from around the world, representing a broad array of disciplines — from cardiovascular health to cancer to heart disease, osteoporosis, neurological diseases of aging, and more — gather for the summit. This year’s 20th consecutive gathering will take place from September 27-29 at the Bar Harbor Club. “For the last 20 years, this small but powerful group of scientific researchers has gathered to share their latest knowledge, findings, and breakthroughs about the human health benefits associated with eating Wild Blueberries,” said Kit Broihier, MS, RD, LD, nutrition advisor to the Wild Blueberry Association of North America and organizer of the summit. “The antioxidant health story was virtually unknown when we began, yet it has become one of the most powerful health narratives of our time,” she noted. “The antioxidant breakthrough was the beginning of a movement to understand the critical role that naturally occurring phytochemicals in plants play in the human diet. It’s led to a growing body of research that will bring even greater scientific understanding of how these tiny berries can help make a big impact on human health,” said Broihier. Dr. Ronald Prior (USDA, Arkansas Children’s Nutrition Center) the celebrated researcher who did the initial research in applying the lab test called ORAC (Oxygen Radical Absorbance Capacity) to study the antioxidant capacity of fruits, vegetables, and other natural products, was among the initial group of researchers to attend the Health Research Summit. “This gathering was the first of its kind among food commodity groups, and it’s important to remember that our understanding of the nutritional benefits of blueberries was quite limited at the time,” noted Dr. Prior. The ORAC test was a game-changer for the Wild Blueberry industry because it identified that on a fresh weight basis, Wild Blueberries contained more total antioxidant capacity (ORAC) than 20 other fruits and veggies, including cranberries, strawberries, plums, raspberries and even cultivated blueberries. Since that time, Dr. Prior has received numerous awards and recognition for his groundbreaking work. “The Wild Blueberry Health Research Summit is special because it is comprised of a multidisciplinary group of scientists who are actively involved in research devoted solely to examining the extraordinary health benefits of Wild Blueberries,” said Dr. Prior. The Wild Blueberry Health Research Summit was created in 1997, when a small group of Wild Blueberry industry experts returning from a meeting in Halifax, Nova Scotia, envisioned an annual research event where top scientists from a variety of research fields would converge and collaborate. The first gathering was held in August 1998 with 12 researchers. Over the years, the Wild Blueberry industry has sponsored numerous studies and invested more than a million dollars in health research. “The multi-day event was about sharing knowledge, doing great work, and building long-term relationships,” says Dr. Mary Ann Lila, Director of the Plants for Human Health Institute at North Carolina State University, and a foremost expert on the health benefits of Wild Blueberries. “Meeting with other researchers is what catalyzes momentum. We can review our progress, brainstorm ideas, and learn from each other. It’s these discussions that trigger new ideas and collaboration,” said Dr. Lila, who has published hundreds of studies focusing on the bioactive compounds in foods, particularly fruits and vegetables. When the Wild Blueberry Health Research Summit began, health research with the fruit was being done at the test-tube level. Since that time, it has quickly evolved to animal studies and now to human trials. “Some of the most compelling areas of research right now are in cognitive performance, metabolic syndrome, obesity, and diabetes,” notes Dr. Lila. Cancer and cardiovascular disease are huge issues, and the benefits of Wild Blueberries in these arenas are evident, but these conditions are not directly relevant to everyone. “Everyone is aging, however, and declines associated with aging are issues that everyone will face,” she noted. Antioxidant Research: Helps prevent oxidative stress, which is linked to chronic disease and aging. Brain Health and Cognitive Research: Potential to improve memory, mood and cognitive function in older adults and prevent the devastating effects of Alzheimer’s disease. Most recently, positive effects on cognition in young children were examined. Cancer Research: Inhibits both the initiation and promotion stages of cancer; specifically, the potential to inhibit the growth of Triple Negative Breast Cancer (TNBC). Diabetes and Metabolic Syndrome Research: Improves insulin sensitivity, and reduces the risk of diabetes and metabolic syndrome; the bioactive compounds in blueberries increased the participants’ insulin sensitivity—a key factor in preventing type 2 diabetes. Gut Health: Supports better gastrointestinal health by promoting an increase in beneficial gut bacteria. Hearth Health Research: Cholesterol and blood pressure-lowering abilities and improves vascular function in people at risk for heart disease. Metabolism Research: How the body absorbs and metabolizes phytonutrients, including anthocyanins, and the importance these compounds may play in a healthy diet. “Twenty years of powerful research has shown us that, not only do the potent phytonutrients in Wild Blueberries have many potential roles in human health, their impacts are frequently interrelated,” said Broihier. “What affects the eyes affects the brain affects the gut. The research community did not know this 20 years ago,” she added. 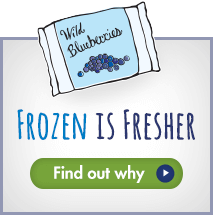 Over the last 20 years, the Wild Blueberry has gone from an ingredient in baked goods to a product that is widely available in the freezer aisle of grocery stores. “We went from being a blueberry muffin berry, to being recognized as one of the healthiest super foods you can eat,” said McBrady. “With today’s consumers growing increasingly health conscious, having scientific research backing up the Wild Blueberry is incredibly important to our marketing efforts and outreach,” she added.